JJ Abrams, who launched the new era of Star Wars films with The Force Awakens in 2015, is returning to the series as director of Star Wars: Episode IX. Lucasfilm president Kathleen Kennedy said "JJ delivered everything we could have possibly hoped for" in the earlier instalment, and she was excited he was returning to "close out this trilogy". Abrams replaces Colin Trevorrow, who dropped out of the film last month. Meanwhile the release has been delayed by six months, to December 2019. The announcement was made on Twitter by Walt Disney Studios, which owns Lucasfilm, on Friday. Chris Terrio will co-write the ninth instalment with Abrams. He won an Oscar for writing Argo in 2013 and his other scripts include Batman v Superman: Dawn of Justice and the forthcoming Justice League. The return of JJ Abrams to the Star Wars universe is a big deal for fans and for Lucasfilm. After the lacklustre prequel films, he made the series relevant again - delivering, in The Force Awakens, a movie that satisfied fans of the original 70s/80s trilogy, and excited a new audience, not to mention taking $2bn in ticket sales. Since Disney bought Lucasfilm from George Lucas, the production giant has often had trouble marrying the visions of individual directors with its own clear view of how its most lucrative property should develop. Several directors have been left by the wayside. 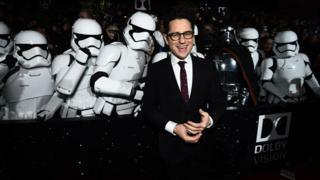 JJ Abrams has so far proved to be one of the few directors who's been able to balance his individuality as a film-maker with Lucasfilm president Kathleen Kennedy's more than firm hand on the movies. This news signals a return to stability in the saga of Star Wars series. Episode IX is expected to star Daisy Ridley and John Boyega. Rian Johnson is directing the second in the current trilogy, Star Wars: The Last Jedi, which will be released this December. Deadline reported that Johnson had declined an offer to take over Episode IX before Abrams was approached. Most Star Wars fans on Twitter welcomed Abrams' return to the franchise. Trevorrow, who directed Jurassic World, left the director's chair because he and Lucasfilm had differing "visions", the company said. Lucasfilm has a reputation for ruthlessness when it comes to hiring and firing directors. In 2015, Fantastic Four's Josh Trank was dropped from directing a standalone Star Wars story. Phil Lord and Chris Miller also left the Han Solo standalone movie with only a few weeks left in production, and were replaced by Ron Howard.